Marmot RidgeField LS. 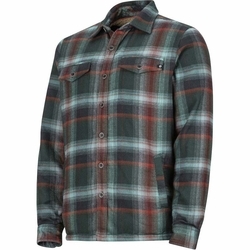 The heavyweight Men's Ridgefield Long-Sleeve Shirt lives between shirt and jacket and right at the base of cold weather. High-pile bonded shearling provides warmth and comfort while the polyester dries quickly to keep you comfortable. A zippered chest pocket keeps the essentials accessible. Elastic binding at the hem and cuffs prevents drafts.